Amid President Trump’s threats to undercut the Affordable Care Act, the nation’s health insurers are warning of a fresh round of premium increases as high as 30 percent in some portions of the country. New data from the Department of Health and Human Services (HHS) first reported by The Wall Street Journal show major insurers in Idaho, West Virginia, South Carolina, Iowa and Wyoming are requesting premium increases averaging about 30 percent. Elsewhere in New Mexico, Tennessee, North Dakota, and Hawaii, insurers have filed Obamacare premium hikes averaging at least 20 percent. In one case, Health Care Service Corp., a major regional insurer, is seeking increases of 8.3 percent in Oklahoma, 23.6 percent in Texas, and 16 percent in Illinois. The proposed increases would rival last year’s 23 percent average increase in premiums for silver and bronze health care plans – combined with heavy financial losses by insurers and a shrinkage in available coverage throughout the country – fueled Republicans’ insistence that Obamacare was in a “death spiral” and needed to be replaced. Trump Administration officials that runaway premium hikes have been a disaster for the government-subsidized health insurance program that benefits millions of Americans. Premiums rose from an average of $232 month in 2013 to $341 in 2014 –a 46 percent increase that coincided with the formal launching of the Obamacare website, according to HHS figures. The following year, 2015, premiums rose by an average of just 4 percent, according to HHS, and then rose again by an average of eight percent in 2016 – before spiking at 23 percent this year. 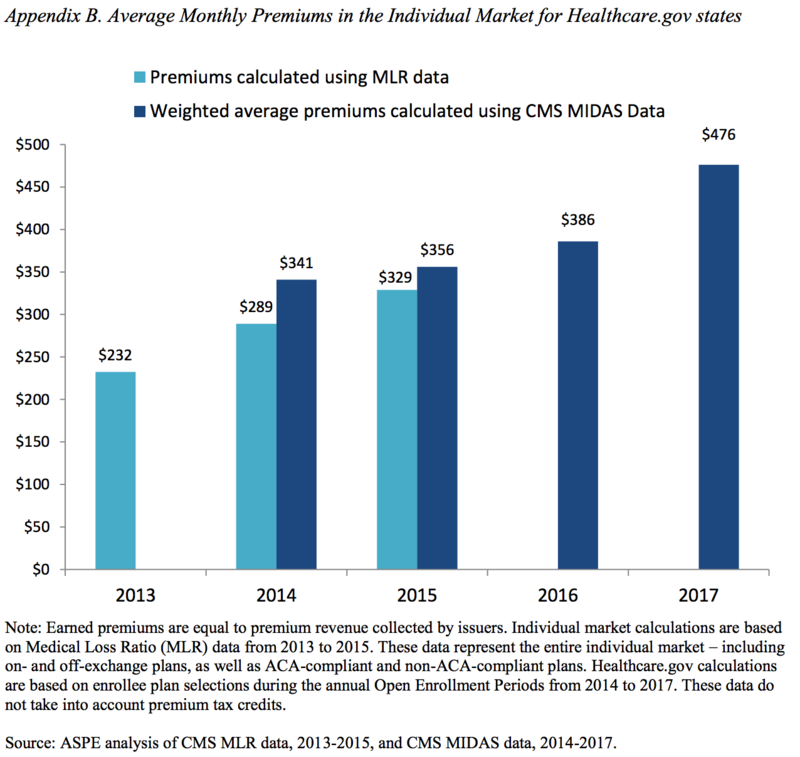 Since Trump took office in January, HHS has begun releasing data and analyses to buttress their argument that premiums and co-payments are out of control under Obamacare. Recently, officials noted in a report that average insurance premiums have risen by 105 percent between 2013 and 2017. Many major insurers including Aetna, UnitedHealthcare, Blue Cross & Blue Shield and Anthem have already pulled out of some markets or threatened to abandon others. Anthem, which is requesting average rate increases of 30 percent or more in states including Colorado, Kentucky, and Nevada, has said it would seek even higher rate increases if the uncertainty over the future of Obamacare persists. Since the Republican effort to repeal and replace the Affordable Care Act collapsed last week in the Senate, Trump and his top advisers have warned of executive action to try to destabilize the government subsidized insurance market, including cutting off a $7 billion a year cost-sharing subsidy used by insurance companies to reduce co-payments and other out of pocket costs of low-income people and ending enforcement of a mandate requiring all uninsured Americans to sign up for coverage. The White House has said that Trump could decide as soon as this week about the future of the cost-sharing subsidy. Republicans have long opposed the cost sharing subsidy that benefits roughly seven million middle and low-income Americans, arguing that Congress never approved a specific appropriation for it. House Republicans filed a lawsuit in federal court in late 2014 challenging the constitutionality of the subsidy and gained a favorable ruling in a federal district court. The Obama administration appealed that ruling to the U.S. Court of Appeals for the District of Columbia, but it’s unclear whether the Trump administration will continue the appeal or drop it and discontinue the month to month payments of the subsidies to insurers. Many insurance companies have warned that they may seek even higher premiums for the coming insurance season if Trump makes good on his threats. Indeed, Health Care Services in Montana attributed 17 percentage points of its proposed 23 percent rate increase to concerns about the subsidy and enforcement of the individual mandate – a core element of Obamacare critical to bolstering long term enrollment. On Tuesday, the court of appeals issued a ruling that may strengthen the prospects of sustaining the subsidy by allowing a coalition of 16 state attorneys general who all favor the subsidy to intervene in the appeal process. Moreover, Sen. Lamar Alexander (R-TN), chair of the Senate Health, Education, Labor and Pensions Committee, is urging Trump to delay action on the subsidy until lawmakers have a chance this fall to consider legislation that would make the subsidy permanent.